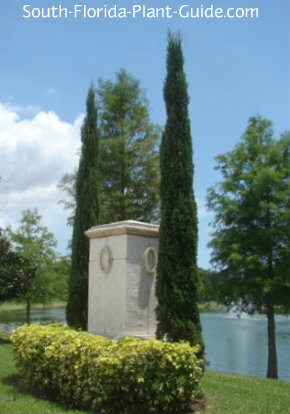 The noble Italian cypress tree lends a touch of rich elegance to a large home with a formal landscape. Like something out of a romantic Italian painting, these stately columnar trees - sometimes known as Mediterranean Cypress or Tuscan Cypress - are beautiful in just the right setting. With a very tall and narrow shape, the tree can can fit in tight spaces, form a picturesque privacy screen, or go up against a house. It's especially effective when used with Spanish-Mediterranean architecture. 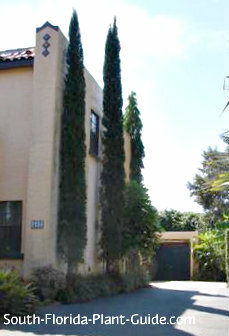 Italian cypress needs a home of height and substance. Eventually soaring to 30 feet or more, this tree will overwhelm a smaller home and look silly...and at that point the homeowner usually removes the tree because he didn't understand how big it would get. The eastern Mediterranean region that this cypress is native to is much drier than South Florida. And some cypress trees don't really like our climate and can develop some problems. 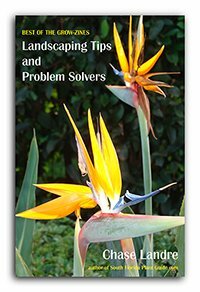 Ways to avoid issues with fungus are placement that allows good air circulation around the tree, choosing a well-drained spot for planting, and watering with an irrigation system so that spray doesn't hit the foliage. This evergreen tree grows at a moderate pace to about 30 to 40 feet tall. It rarely gets more than 3 or 4 feet wide. Cypress is cold hardy and grows anywhere in South Florida. It must have well drained soil and does best in full to part sun. Add composted cow manure to the hole when you plant. Avoid heavy mulch around the tree's base. These trees should never be sheared or pruned. They have a nice natural shape that looks good without any extra care, and cuts and bruises can let problems in. Water on a regular basis, allowing time between waterings for the soil to dry out. Avoid overhead watering where the foliage gets wet. Fertilize 3 times a year - in spring, summer and autumn - with a good quality granular fertilizer. 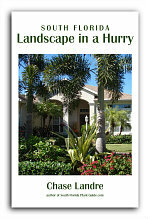 For a row of these stately trees, place them about 3 feet apart to form a privacy screen. You can plant as close to the house as 3 feet, though it's best to make sure there's enough room between the house and the tree's mature diameter for good air circulation. This tree will grow in a large container though at some point it will be too large to stay there. 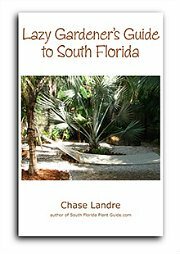 COMPANION PLANT SUGGESTIONS: Variegated pittisporum, canna lily, dwarf fakahatchee grass, bougainvillea, king sago palm, and hibiscus.